In my blog Baybayin Alive, I encourage people to explore an indigenous way of thinking in order to understand the deeper meanings of the Baybayin Symbols. You can read that post at Holistic Approach: Returning to Ancestral Thinking. 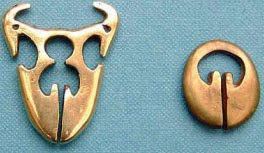 both of which are yonni symbols or fertility symbols. The lingling-o is a common ancient artifact symbolizing fertility found around Southeast Asia and the Philippines(ca. 500 B.C.–100 A.D.); dinumug is a fertility symbol and symbol of prosperity and love found in the Ifugao, Bontoc and other Cordillera regions of the northern Philippines. This particular post at Baybayin Alive goes on to talk about how the fertility symbol shape could very well be the imagery from which the BA baybayin symbol (clefted version) evolved from.